I am always proud when Hawaii people do well at the national and international level like Guy Kawasaki, a businessman, entrepreneur in technology, and author. He helped develop Apple in the 1980s, co-founded Garage Technology Ventures, a venture capital firm that invests in technology start-ups, and Alltop.com, an online magazine rack. Guy Kawasaki’s father is Duke Kawasaki, a former Hawaii State Senator. Currently, he is the special advisor to the CEO of Motorola, a Google Company. At about 2:00 A.M. on Thanksgiving Day, Thursday, November 28, 2013, I finished my 8th draft of my writing project. I think I will let it be for now and start working on my 2nd writing project. 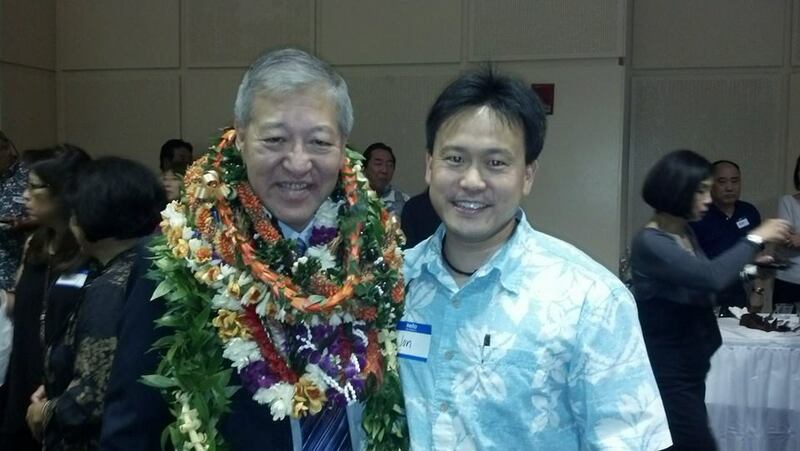 With Honolulu Prosecuting Attorney Keith M. Kaneshiro at his fundraiser on the evening of Thursday, November 14, 2013 at the Blaisdell Center. Please support Keith in his bid for re-election in 2016. Mahalo! This evening, November 13, 2013 from 6:30 PM to 8:45 PM, I attended the Pearl City Lions Club meeting at Pearl Country Club. I was their guest speaker and talked about lobbying the legislature. I shared my experience as a legislator and now as a lobbyist for the Department of the Prosecuting Attorney of the City and County of Honolulu. They presented me a certificate of appreciation and some members gave me raffle tickets and their snacks that they won. I had a nice time. I don’t know if I could ever accept death so I race against it every single day. Every single one of us can play a role in bettering our world just by being nice to everyone we come into contact, every single day. In my early twenties, I put aside my work in popular culture and focused on mainly law and politics, but I have come back full circle to the arts, as I feel it can best reach into the souls of the human race since too often, the clouds of anger blinds our efforts in law and politics.